Beautiful early view of Central Park's iconic Bow Bridge. Central Park. The Lake and The Bow Bridge. 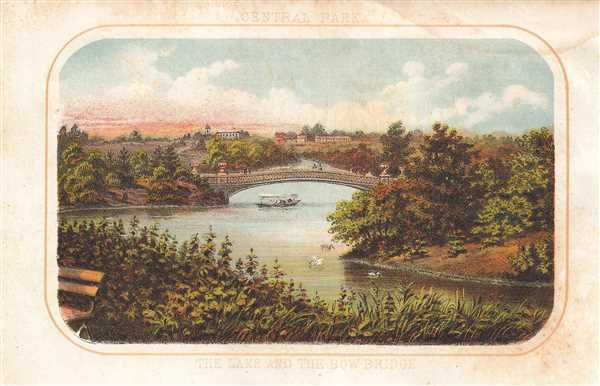 This is a lovely 1868 Shannon and Rogers view of the Bow Bridge and the Lake in Central Park, by Shannon and Rogers. The Bow Bridge, built in 1862 is located roughly at 74th street in the heart of New York City’s Central Park and connects the Ramble and Cherry Hill. Named for its shape is the second oldest cast-iron bridge in the United States. Vaux and Olmstead envisioned this refined, low-lying bridge instead of a suspension bridge requested by the commissioners. Today it is one of the most picturesque parts of the park and a popular subject for photographers and artists. . Prepared for inclusion in the 1868 edition of Joseph Shannon's Manual of The Corporation of the City of New York. Very good. Light foxing. Minor soiling along top margin. Blank on verso.